So my BF asked me last night, “What do I do with all this?” The “this” in question were the assload of carrots he bought on a grocery shopping frenzy. Not being a ginormous carrot fan myself, I couldn’t think of anything off the top of my head. So I turned to my latest issue of Vegetarian Times (Jan/Feb ’11) on a whim. And what do you know? VT saved the day with this warm, comforting Sweet & Spicy Carrot Bisque. Aylene Lambert, a graduating chef from the Natural Gourmet Institute in NY, concocted this delish recipe for Vegetarian Times‘ “Veg Valedictorians” contest. Her recipe won in the category for “best soup.” And I can see why! I did make a few tweaks, using olive oil instead of canola oil. And Lambert’s recipe calls for curry powder but since I never like the premixed spice blends, I made my own curry instead. The sweetness of the coconut milk and banana blends beautifully with the fragrant heat of the spices. On a cold winter’s day, this creamy bisque will nourish you with each harmonious bite. As forecasters predict New England will be slammed with yet another snow storm (oh christ, kill me now! ), I know what I’ll be eating while curled up in my jammies. 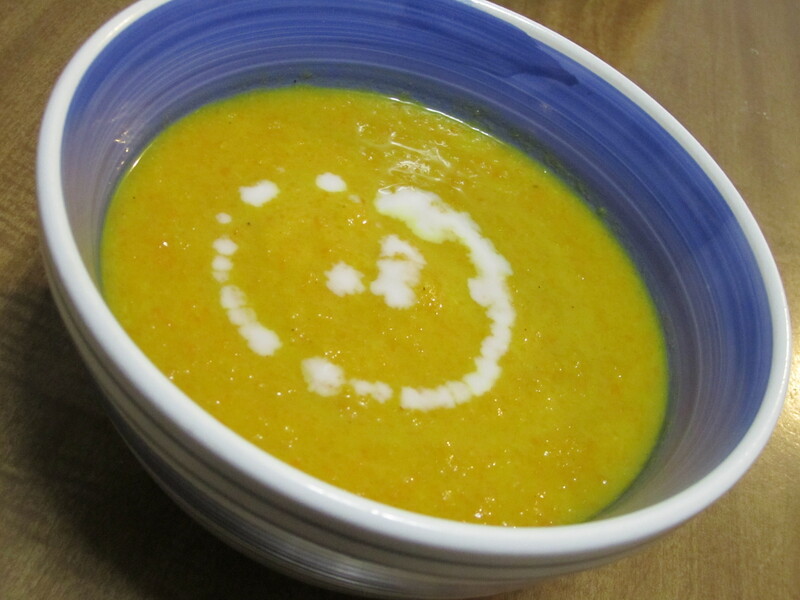 Click here for the recipe for Sweet and Spicy Carrot Bisque.